In this title, originally published in 1981, author Robert P. Taylor calls for a greater understanding of rural energy supply and consumption patterns in the developing countries. 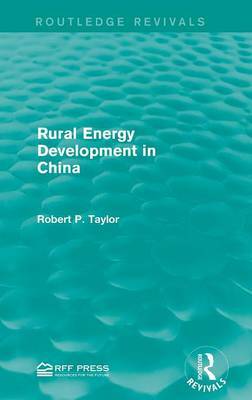 Here, Taylor specifically examines the rural energy development in China as it is the world's largest developing country in terms of population, and it has encountered many of the rural energy problems common in other developing countries. This study provides an analysis of China's rural energy economy from before 1949 to a general discussion of achievements in rural energy development and the rural energy economy in 1981. This is an ideal title for students interested in environmental studies and development studies.